New Jersey Governor Chris Christie said removal of the bridge’s lower roadway means larger ships will be able to call container terminals in Newark, Elizabeth and Staten Island. Ultra-large containerships carrying up to 18,000 TEUs will be authorized to pass beneath the Bayonne Bridge between New Jersey and Staten Island starting June 30, New Jersey Gov. Chris Christie said at Maher Terminals in Elizabeth, N.J. on Tuesday. These ultra-large containerships will be able to call APM Terminals and Maher Terminals in Elizabeth, N.J.; the Port Newark Container Terminal in Newark, N.J.; and the GCT New York terminal on Staten Island. The original roadway on the Bayonne Bridge, which was built in 1931, was 151 feet above the waterway below,the Kill Van Kull, at mean high water. The Port Authority of New York and New Jersey had a second roadway built above the original roadway, at 215 feet above the Kill Van Kull at mean high water, and had the lower roadway demolished. 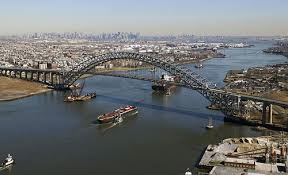 The original cost estimate of the project to raise the height of the Bayonne Bridge totaled $1.3 billion, but has increased to $1.6 billion, Steve Coleman, a spokesperson from the port authority toldAmerican Shipper. Looking ahead, Molly Campbell, the director of the port department of the Port Authority of New York and New Jersey, said she expects some carriers to move rapidly to increasethe size of ships calling the port, bringing vessels between 10,000 and 14,000 TEUs in the short-term, and vessels as large as 18,000 TEUs in the future. Coleman also said the agency is in discussion with several ocean carriers that are looking to bring larger ships to the port as soon as possible.